MAN Truck & Bus Middle East has recorded an increase of 54 per cent in the number of fleet owners and drivers taking part in its road safety training in 2014 as compared to last year. More than 700 drivers have been trained by MAN over the last 2 years through ProfiDrive training conducted across the region. ProfiDrive training is a specialized training programme designed to raise the level of knowledge so that drivers can adopt the best driving practices. In a one-day seminar, they learn predictive driving techniques such as how to recognise dangerous situations, calculate the optimum stopping distance and evade obstacles that suddenly emerge. MAN has been offering the service to its customers in the Middle East for on-road operations since 2009 and recently expanded its scope by launching its new off-road training module to cover all aspects of truck operation in the region. 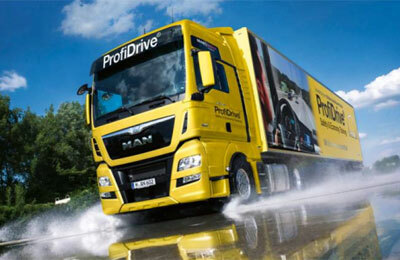 In addition to having its own certified trainer for ProfiDrive, MAN is now also assisting customers with large fleets to have their own in-house trainer for their dedicated requirements. “The most effective accident prevention system is behind the steering wheel – the driver. It is important for the driver to drive with foresight, remain calm and confident in critical situations, and stay in control of the vehicle. “Driver errors typically cause more than 90 per cent of accidents. Our ProfiDrive training has been specifically designed to enhance driver skills and the growth in demand for ProfiDrive as well as repeat sessions points to the effectiveness of such training,” he added. “While technology and training have a significant bearing on raising safety standards, what we also focus on during our discussions with customer is the impact of driver fatigue in safety incidents. It’s important to monitor the operating hours of drivers so that they can stay alert while driving. Even here, technology can come to the rescue with devices like the tachograph which automatically records vehicle speed and distance, together with the driver's activity when he starts his shift,” Dr Brown noted. While driver training is an essential component, MAN has also been communicating the importance of proper vehicle maintenance with customers to keep their vehicles in the best condition to maintain safety standards. In addition to this, the importance of genuine spare parts in maintaining safety is also another factor that MAN has focused on in its discussions with customers.